The Clinical Element Model Browser displays Clinical Element Models (CEMs) developed by Intermountain Healthcare and GE Healthcare/Caradigm. CEMs are Intermountain’s strategy for representing detailed clinical models – granular, computable models defining the logical structure of data elements used in healthcare. Intermountain is currently representing CEMs using the Constraint Definition Language (CDL), a context-free grammar developed by GE Healthcare. In 2006, Intermountain Healthcare and GE Healthcare entered into a partnership to develop a clinical information platform that implemented CEMs. CEMs developed by Intermountain during the partnership became GE copyright material, licensed to Intermountain under an open content license agreement. Under the terms of that license, Intermountain distributes the models and associated terminology to external parties who can use them without fee or royalty. An Intermountain copyright notice on the main page refers to the site itself, not the models. The intention is to present new releases of models on a monthly basis. Go to the Model Request site located at http://www.clinicalelement.com/. 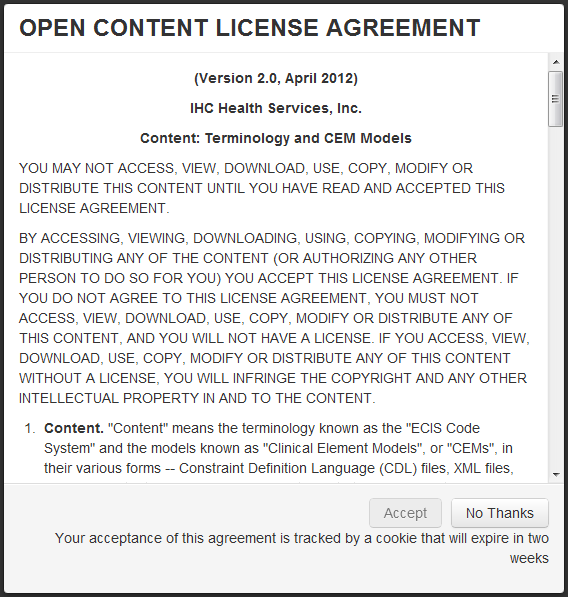 On a user’s first visit to the site, the Open Content License Agreement will appear. 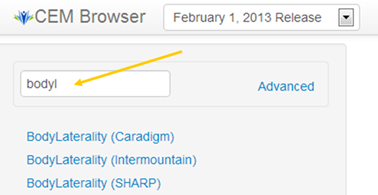 NOTE: Always use the latest version of the internet browser being used to open the Clinical Element Model Browser. This agreement describes the user’s responsibilities toward use of the CEMs and related terminology. The user is required to scroll to the end of the license and click the Accept button. Accepting the agreement remains valid for 14 days. After 14 days the license will need to be accepted again. The license agreement is available for viewing at any time from the main page after the license has been accepted. When the license has been accepted, the user is brought to the main page. For the purposes of this site, a release is a collection of models distributed at a point in time as a snapshot of our repository. For each dated release there are three collections of models; Intermountain, SHARP, and Caradigm. 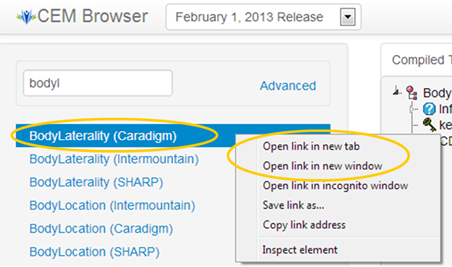 From the main page the most current release will automatically populate the browser. The user can also select a specific model release from the drop-down list under Releases. Once a release is selected, all models for that release will appear in a list in the left panel of the screen. 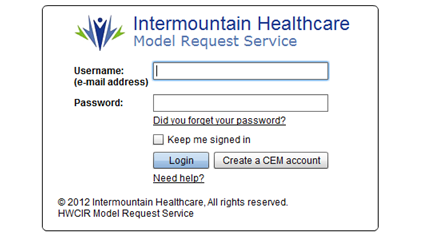 Intermountain contains models in use by Intermountain Healthcare. SHARP contains models in use in the Strategic Health IT Advanced Research Project (SHARP) project. For these models, the Tree view also shows elements inherited from the SHARP reference classes, used for the SHARP implementation. A reference class contains metadata elements of use to an implementation. Patient identifier, database storage time, and source application identifier are examples of such elements. These inherited elements are shown in gray, as noted in the Legend. Caradigm contains models in use by the Caradigm Qualibria implementation. 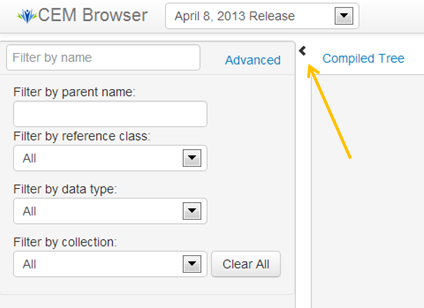 From the main page a user can select a specific model release from the drop-down list under Releases. Once a release is selected, all models for that release will appear in a list on the left of the screen. 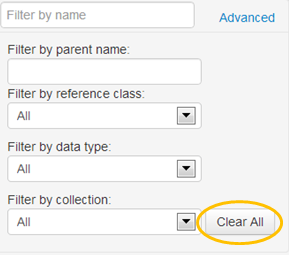 To search for a specific model, type the name of the model and the display will show those models containing the filtered criteria. The desired model can then be opened by selecting it from the filtered criteria in the left panel. NOTE: Multiple-word models should be typed without spaces. NOTE: Keyboard shortcuts can be used: pressing [Tab] will toggle through the buttons and CEMS listed in the left panel and [Enter] will select the CEM or button that is highlighted. Each CEM listed in the left panel will also include the collection in parentheses. The full name of the CEM and its collection can also be viewed by hovering the cursor over the CEM. A pop-up will appear and show the full name of the CEM and its collection. The specific model information will appear to the right. The user can choose to view the model in Tree view, CDL or XSD by selecting the corresponding tabs along the top. To clear search criteria, click on the Clear All button. The browser search section may be collapsed by clicking on the arrowhead near the filter options. To expand the search section, click the arrowhead again. The browser search may be resized by clicking and dragging the border to the left or right. There are two options to open more than one model at a time. Hover over a model from the list in the left panel, right click on the selected model then choose the Open link in new tab/Window option. Right click on a model that is open in the compiled tree view then choose the Open link in new tab/Window option. Once the arrow is clicked, the information is expanded. NOTE: When the information node is expanded, a formatted and detailed summary of the information node will be displayed. To hide the details, select the down-arrow head and the node will collapse again. NOTE: Definitions for the models can be viewed in the CDL View. The entire tree can be expanded or collapsed by clicking either the Expand All or the Collapse All buttons. NOTE: The Expand All button may take a few seconds to load the expanded tree view. Valuesets and terminologies associated with individual SHARP models will be displayed in a popup window. To open the popup, click on the valueset. To close the popup, click outside of the popup window. When the Legend button is clicked, a screen elements legend appears at the right of the screen. To close the legend pop up, click the Legend button again. 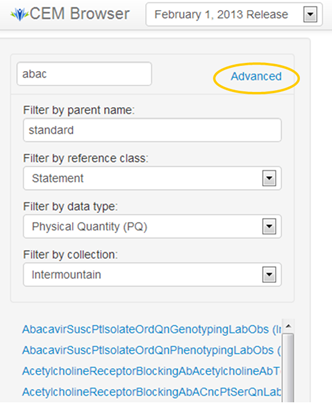 *A reference class contains implementation-specific metadata such as instance ID, patient ID, etc. When a CEM is used in an implementation (e.g., SHARP or Caradigm), the CEM inherits these reference class elements. NOTE: If there is a list of data types separated by commas, the user can choose from any of the listed data types. When the Data Types button is clicked, a data type console will appear at the bottom of the screen. This console contains information that describes data types in more detail. Concept Descriptor (CD): A reference to a concept defined in our default code system. code A code for a concept defined in the primary code system. codingRationale CodingRationale provides a reason why a particular CD has been provided, either as the root concept or as one of the translations. originalText The text seen and/or selected by the user who entered the data. translation A set of other CDs that each represent a translation of this CD into equivalent codes within the same code system or into corresponding concepts from other code systems. Coded Ordinal (CO): Coded data that defines an order on the codes in our default code system, for example, the codes for "1+", "2+", etc. code A code for a concept defined in the primary code system. Code is required. codingRationale CodingRationale provides a reason why a particular CO has been provided, either as the root concept or as one of the translations. translation A set of other COs that each represent a translation of this CO into equivalent codes within the same code system or into corresponding concepts from other code systems. value A numeric representation of the code's meaning. Integer Value (INT): Integer numbers (-1,0,1,2, 100, 999999, etc.) are precise numbers that are results of counting and enumerating. operator =, >, <, >= or <=. Absence means exact ("="). Real Number (REAL): Real numbers (1.5, 2.3 etc). The typical representation is decimal, where the number of significant decimal digits is known as the precision. There is no unit of measure for REAL data type. storagePrecision The number of significant floating point digits of the stored real number. value The value of this real number. Physical Quantity (PQ): A dimensioned quantity expressing the result of measuring. It will have unit of measure information. codingRationale CodingRationale provides a reason why a particular PQ has been provided, either as the root value or as one of the translations. storagePrecision The number of significant floating point digits of the stored double number. translation An alternative representation of the same physical quantity expressed in a different unit, of a different unit code system and possibly with a different value. unit A code for a unit of measure concept defined in the primary code system. unitOriginalText The unit seen and/or selected by the user who entered the data. value The magnitude of the quantity measured in terms of the unit. Interval of Physical Quantity (IVLPQ): A set of consecutive values of physical quantities, for example, [1, 10]. codingRationale CodingRationale provides a reason why a particular RTOPQ has been provided, either as the root concept or as one of the translations. high The high end of the interval. low The low end of the interval. originalText The value seen and/or selected by the user who entered the data. Ratio (RTO): A quantity constructed as the quotient of a numerator quantity divided by a denominator quantity. The RTO data type supports titers (e.g., "1:128") and other quantities produced by laboratories that truly represent ratios. denominator The denominator of the ratio. numerator The numerator of the ratio. subtype The type of this RTOPQ, for example, a TITER. Instance Identifier (II): An identifier that uniquely identifies a thing or object. Examples are medical record number, order id, Social Security Number (SSN), Vehicle Identification Number (VIN), etc. correlationId An identifier that references the set of values required to interpret the value in root (for example, namespace, assigning, authority, etc.). It is assumed that this information is maintained in a separate store and that this identifier serves as a key to access that information. extension A unique identifier within the scope of the identifier root. type The type of the identifier. language For character based information the language property specifies the human language of the text. translation Alternate renditions of the same content translated into a different language. The translation property is a set of STNT that each translate the first rendition into a different language. value The sequence of characters that make up the content of the string. Time Stamp (TS): A quantity specifying a point on the axis of natural time. A point in time is most often represented as a calendar expression. originalText The text representation from which the time was encoded, if such a representation is the source of the time. storagePrecision The number of significant digits of the calendar expression representation. timezone Time zone of the point in time. value UTC representation of the point in time. 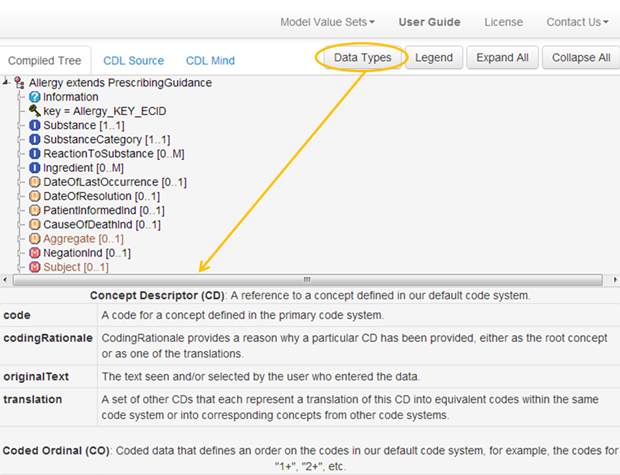 Definitions for the models can be viewed in the CDL view. 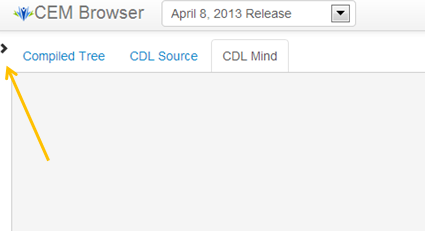 To view the CDL source of the current model, select the CDL tab. NOTE: This tab only shows the CDL for the currently selected model. It does not show the CDL for any models referenced by the currently selected model, for example, qualifiers, modifiers, items, or attributions. To view the CDL for those models, select those models individually. Comments can be viewed or hidden by clicking the Hide Comments/Show Comments button. Model information can be downloaded by clicking the Download File button. To view an XSD generated from the selected model, select the Compiled XSD tab. NOTE: The XSD is an implementation of the CDL model specific to Caradigm and SHARP projects (i.e., it is a structure that may be used for capturing a data instance conforming to the logical CDL model). It contains the structure not only of the selected model, but of any and all models referenced (i.e., as by the selected model, for example, qualifiers, modifiers, items, and attributions). This tab will not be available for projects that do not have an implementation. The XML Schema can be downloaded by clicking the Download File button. NOTE: If the XSD download is not successful, right click on Download File button and select the Save As option. Some clinical element models have the option to view a mind map associated with the model. If the model has a mind map, the CDL Mind tab will appear. Click on the tab to see the mind map. An annotation is indicated by a yellow box, such as the one seen to the left of StandardLabObs above. The mind map may be expanded further by clicking on the name, or a small circle next to the name if applicable, such as the one seen to the left of StandardLabObs. Click on the circle or name again to collapse the expanded view. The mind map may be moved around on the screen by clicking any part of the model and then dragging it as desired. For more information about the program used to create these mind maps, see the FreeMind website. The mind map can be downloaded by clicking on the Download File button. Selecting Model Value Sets allows the user to download a SHARP or Non-SHARP spreadsheet containing the value sets and codes referenced in the CDL models. In a future version, terminology content will be more dynamically available by clicking on references in the models. Selecting User Guide allows the user to see this document. Selecting Contact Us brings up a menu with several ways to contact the modeling team. This site allows users to participate in a short survey to help improve the CEM Browser and Model Request Service site. Allows the user to send an email to terminology@imail.org. Use this email address to provide feedback or to ask questions to the development team. To request a new model or change an existing model, select Model Request/Comment (see below). Allows the user to request a new model or change to an existing model. Clicking this link will bring up the Model Request Service login site. New Users must create a login ID and password prior to submitting a request. NOTE: The CEM Model Request Service site is currently in pilot use. Users are advised that no service level agreement is yet in place for use of this site.